The German violinist Frank Peter Zimmermann and pianist Martin Helmchen countryman They have embarked on an ambitious project to interpret the integral of the sonatas for violin and piano by Beethoven presenting them in three sessions, last season 2019/20. It is true that in recent years the press has praised both for their magnificent performances Beethovenian, but still surprised they start their career with a repertoire so committed. Apart from his admiration for the genius of Bonn, They have announced that they will not ignore the revolutionary momentum that characterizes the composer's music with its lurid passages and dissonant frictions. 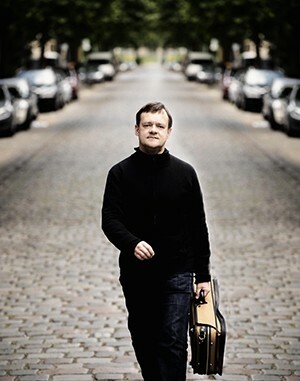 Frank Peter Zimmermann It is one of the most important violinists of his generation. Praised for his musicality and his staff clear and brilliant intelligence, He has performed with leading orchestras around the world for nearly three decades collaborating with the most important directors. Its multiple engagements have taken him to major concert halls and music festivals in Europe, U.S, Japan, South America and Australia. During the season 2017-2018 Frank Peter Zimmermann was artsita resident NDR- El bphilharmonie Orchestra. Other highlights included engagements with the Trio Zimmermann concerts in Paris, Dresden, Berlin and Madrid and summer festivals of Salzburg, Edimburgo y Schleswig-Holstein, concerts in Amsterdam and a tour in Seoul and Japan with the Royal Concertgebouw Orchestra and Daniele Gatti, a short tour in Europe and a concert at Carnegie Hallen New York with the Symphonieorchester des Bayerischen Rundfunks and Mariss Jansons, concerts Tonhalle-Orchester Zürich and Bernard Haitink and European tour Berliner Barock Solisten. With director Daniel Harding played with the Orchester de Paris and the Swedish Radio Symphony Orchestra and performed in concert for a week in China with the Shanghai Symphony Orchestra and Ghuangzhou and the China Philharmonic Orchestra (inauguration of the Music Festival in Beijing), all of them led by Long Yu. y Jakub Hrůša, Symphonieorc hester the Bavarian Radio y Yannick Nézet-Séguin, The Bavarian State Orchestra y Kirill Petrenko, Philharmonia Orchestra and Juraj Valcuha and Rafael Payare, Berliner Philharmoniker y Alan Gilbert, New York Philharmonic Orchestra y Alan Gilbert, Russian-German Academy of Music and Valery Gergiev, Orchester National de France y Berlin Baroque Soloists, Bamberger Symphoniker and Manfred Honeck and Vienna Symphony Jakub Hrusa. Antoine Tamestit next to the viola and cellist Christian Poltera form the Trio Z Immermann. This string trio acts at major music centers and festivals in Europe. BIS Records released three CDs with works for string trio by Beethoven (On. 3, On. 8 y on. 9), Mozart (Divertimento KV 563) y Schubert (Trio, D 471). Zimmermann has offered four world premieres, the last-in 2015- Violin Concerto no. 2 the Magnus Lindberg con la London Philharmonic y Jaap van Sweden, more performances with the Berlin Philharmonic and the Swedish Radio Orchestra Symp hony , both under the direction of Daniel Harding and the New York Philharmonic Orchestra and Orchester Philharmonique de Radio France, both with Alan Gilbert. further, premiered the Violin Concerto "in sourdine" Matthias Pintscher with the Berliner Philharmoniker and Peter Eötvös (2003), el concierto The Lost Art of Letter Writing de Brett Dean- who received 2009 the 'Grawemeyer Award' for this composition- con la Royal Concert, conducted by the composer (2007) and elConcierto not. 3 “Juggler in Paradise” de Augusta Read Thomas con Orchestre Philharmonique de Radio France y Andrey Boreyko (2009). With his virtuoso style but unpretentious, the pianist Martin Helmchen continues to impress the international music scene including great debuts with the Berlin Philharmonic and Herbert Blomstedt, Vienna Philharmonic and Valery Gergiev, London Philharmonic Orchestra and Vladimir Jurowski and City of Birmingham Symphony Orchestra and Andris Nelsons. United States debut with the New York Philharmonic at Carnegie Hall and at the Tanglewood Festival with the Boston Symphony Orchestra, on both occasions under the baton of Christoph von Dohnányi. Martin Helmchen's interest to explore all facets of music creation seen in his passion for collaboration not only with orchestras, but also through chamber music, following the first collaborations with cellist Boris Pergamenschikow. Since 2010, Martin Helmchen is associate professor of chamber music at the Kronberg Academy. In season 2017-20 18 Helmchen was a soloist with the City of Birmingham Symphony Orchestra and Alexander Vedernikov, Staatskapelle Dresden with Herbert Blomstedt, Sinfonica de Viena con Thomas Netopil, National Orchestra of Belgium with Hugh Wolf, Warsaw Philharmonic Symphony and Olari Elts San Diego and Jahja Ling. Martin Helmchen acts with his wife, the violonchelis your Marie-Elisabeth Hecker, duo and in various collaborations camera. Augustin Hadelich with violinist performed at the Aspen Festival 2017 Carolin Widmann and performed a chamber music project in South America. further, Martin Helmchen performs regularly with Christian Tetzlaff, Antje Weithaas, Sabine Meyer and, since 2018 onwards, con Frank Peter Zimmermann. He gives solo recitals in Chicago, Montreal and major European cities, including the International Piano Series in London, Amsterdam, Stuttgart y Bonn. Continuing his love for lieder recital, Juliane Banse also collaborates with and Julian Prégardien, with the latter at the Wigmore Hall in London. In 2017 Helmchen published two recordings: Beethoven Triple Concerto with Isabelle Faust and Jean-Guihen Queryas with the Leipzig Gewandhaus Orchestra conducted by Herbert Blomstedt (Live for Accentus) and Brahms cello sonatas with Marie-Elisabeth Hecker. With PentaTone, Helmchen has previously recorded Mozart concertos, Mendelssohn, Schumann y Dvorak, and solo recordings and Schubert duos with Julia Fischer. One of the most important early milestones of his career was winning the Clara Haskil Competition 2001. It was Borletti-Buitoni member- Trust and 2005 and “Artista Joven Credit Suisse” in 2006, He is culminating in his debut with the Vienna Philharmonic Orchestra under the direction of Valery Gergiev at the Lucerne Festival. Between 2005 Y 2007, Martin Helmchen was a soloist in the “BBC New Generation Artists”. Galina alumnus Iwanzowa in Berlin, Helmchen continuo sus estudios con aria Vardie en la University of Music Hannover. His other mentors have been Alfred Brendel and William Grant Naboré.